Battery recycling broke records in 2010. Close to 7 million pounds of rechargeable batteries were recycled last year in North America, a 10 percent increase from 2009. According to Call2Recycle, a free battery collection program, the largest collections came from California, Texas and Florida. Batteries contain a high amounts of heavy metals, and contamination of groundwater is more likely if they’re thrown into a landfill and not recycled. Several stores in the Bay City area collect rechargeable batteries for recycling, including Radio Shack, Batteries Plus, Staples and The Home Depot. You can find more listings of recycling centers at Earth911.com. The guide includes information on recycling single-use batteries in Midland. If you have teeth, listen up. The Michigan Department of Natural Resources and Environment has awarded a $270,000 grant to the Michigan Dental Association. The money will go to assist member and nonmember dentists in Michigan with the installation of amalgam separators. Many Michigan waste water treatment plants are required to reduce the levels of mercury discharged to lakes, rivers and streams under their permits. Mercury amalgam from dentists has been identified as a significant source of mercury for some wastewater treatment plants. A 2008 state law requires most dentists to install, operate, and maintain amalgam separators by Dec. 31, 2013. State officials say the programs should result in a decrease in the amount of mercury sent to landfill and discharged to state rivers and streams. Commercial shipping on the Saginaw River declined for the fifth year in the row in 2010. According to Boatnerd.com, which tracks vessel passages in the Saginaw River, the 2010 season lasted for 260 days, beginning March 31 and ending Dec. 15. During that time, there were 145 commercial vessel passages by 29 different boats. Compared to 2009, that’s 18 fewer passages and 8 fewer vessels. The Wirt Stone dock in Saginaw saw the most traffic. Next in line was the Bay Aggregates dock in Bangor Township. Third on the list was the Wirt Stone dock in Bay City. But all of those docks saw less traffic than in 2009. Two vessels made the most trips up and down the Saginaw River last year– the Olive L. Moore and Lewis J. Kuber were tied with 31 trips each. Those totals also were down from 36 trips by the same two boats in 2009. 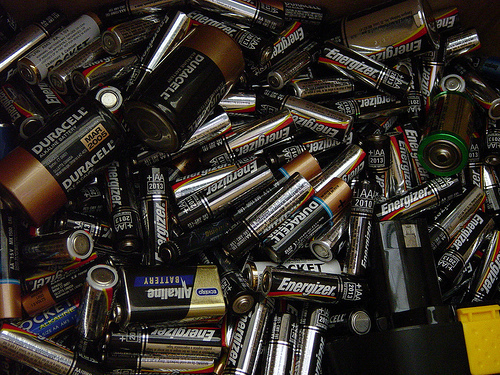 — Battery recycling photo via Moria, Flickr.